Mia Lobo couldn't wait for mid-May when she would graduate from preschool and dance in her first recital. Her family had talked about the big milestones for weeks. The outgoing 5-year-old from a Chicago suburb was a little nervous about the performance, but her father, Dominic Lobo, said he wasn't worried. After all, she was one of those kids who loved the limelight, a "little ball of fire." Mia often held court with her friends and family, playing dress up and stealing her 17-year-old sister's makeup. But on April 12, Mia started complaining she was cold while bouncing on the family trampoline outdoors. Her parents, who are both registered nurses, weren't too worried. Nine days later, she was brain-dead from complications of the flu. Her 2-year-old brother still thinks she's sleeping. "No one thinks this will ever happen to them," her father told HuffPost. "To have it happen to your own daughter is unimaginable pain." The Lobo family are not alone in their grief ― 169 children in the United States have lost their lives this flu season so far. Experts at the Centers for Disease Control and Prevention predict the final toll will surpass 171, which will make this the deadliest season for pediatric deaths from seasonal flu since the CDC mandated they be recorded in 2004. "I don't think people necessarily think, 'Oh my gosh, that's 169 families that now have an empty chair at the dinner table,'" Serese Marotta, CEO of the advocacy group Families Fighting Flu, told HuffPost. Marotta knows firsthand how real those losses are: Her son Joseph died after contracting H1N1 during the 2009 swine flu pandemic, when swine flu deaths exceeded those from the seasonal flu. Pediatric seasonal flu deaths, which are defined as deaths of kids age 17 and under, remain relatively rare. Still, an average of 104 children die in the normal flu year (which is counted from Oct. 1), according to a HuffPost analysis of CDC data beginning in 2004. Although most people assume flu season is over when the winter ends, influenza circulates year-round, said Dr. Lynnette Brammer, head of the CDC's domestic flu surveillance team, and Dr. Tim Uyeki, chief medical officer for the flu division. The current catastrophic bout peaked in early February. The number of reported pediatric flu deaths this season may underestimate the impact of the illness on children. That's because state health departments often don't report these cases to the CDC immediately ― for instance, a pediatric flu death from April was only reported last week. And the 169 reported so far are just confirmed pediatric flu cases that resulted in death ― they don't include the number of children hospitalized with complications, which can range as high as 26,000 in a bad year. States are also not required to report adult flu deaths, which can range from a low of about 10,000 to a high of more than 50,000 each year. The spike in flu deaths among children during the 2017-18 season can be largely attributed to the overall elevated rates of flu infection, according to Brammer and Uyeki. Hospitals were overflowing with adult and child patients at the height of the flu season, and overall hospitalization rates have been record-breaking, according to the CDC. In fact, this season's flu rates have been a third higher than the rates seen in 2014-15, which was considered a particularly severe flu season. Some 710,000 people were hospitalized then. The surge in flu infections this season was due to a mix of factors. The season ramped up early in November, extending the length of time in which the illness spread. The mix of strains ― H1N1 and another Influenza A virus, H3N2, as well as Influenza B viruses ― meant that this season's vaccine was not as effective as it might have been. There was no single strain that was primarily associated with the deaths, Uyeki said. All of these viruses led to fatal outcomes, although Influenza A H3N2, in particular, is known to cause more hospitalizations, complications and deaths. Kids are the primary transmitters of the flu, said Dr. Flor Munoz-Rivas, an associate professor of pediatrics-infectious disease at the Baylor College of Medicine. Once infected, they shed the virus for a longer period and often help circulate it among their parents and community, she said. Children, especially those with underlying health conditions, are also more susceptible than adults to severe reactions and complications from the flu since they may have never been exposed to the illness before. But about half of pediatric flu deaths occur among children with no pre-existing health conditions. April 12 started out like any other day, Dominic Lobo recalled. The family had celebrated the birthday of Apple Lobo, Mia's mom, the night before, and they were bouncing around on the trampoline when Mia complained she was cold. But chilly springs are common in Carpentersville, Illinois, so her parents didn't think much of it. That night, she had a febrile seizure ― a type of seizure brought on by fever that is relatively common in children under 5 and that typically does not have long-term complications. This was the third time Mia had a febrile seizure in her life. Her parents took her to the emergency room, where she was cleared and discharged. The next day, a Friday, they took her to see the doctor. She seemed lethargic but was still chatty, Lobo said, stressing that at no point did she have a cough or cold or any other notable signs of flu besides the fever that had brought on the seizure. That weekend, Mia stopped eating and her parents decided to take her back to the hospital. At the hospital, the little girl lost the ability to verbally respond to questions from her parents and her medical team. "Even though she couldn't talk, she was able to hold our hands really tight," Lobo remembered. He had told her to squeeze his hand as hard as she could. "As the hours passed, she couldn't anymore." Before being transferred to another hospital, Mia suffered a full-blown seizure and was intubated. Over the next several days, doctors ran all kinds of tests and tried a multitude of drugs, but Mia was eventually pronounced brain-dead. She died on April 21. For Mother's Day, three weeks later, the family visited Mia at her grave. "We couldn't stop crying and wishing she was here with us," Lobo said. The shame, Uyeki said, is that these tragedies happen every single year ― but the American public has a short memory. "It's not like it's something that happens every 5 or 10 years. This is a problem every year," the CDC doctor said. "It shouldn't take anyone by surprise." For Marotta, the CEO of Families Fighting Flu, Mia's story is all too familiar. Her 5-year-old son, Joseph, coded and died in the hospital from flu complications in 2009, shortly after talking about what he wanted to be for Halloween. In Marotta's advocacy work, most are surprised to hear of such deadly outcomes. "We hear quite often that people say, 'Oh, it's just the flu,'" she said. That misconception about the danger of the flu can lead to horrific results, Munoz-Rivas told HuffPost. "People think of the flu as similar to the common cold ― oh, it's just another respiratory illness ― and it's not," the Baylor doctor said. Combine that with "not trusting the vaccine or not knowing there is a specific antiviral treatment," she said, and some people can die. Even though there is a vaccine for the flu, only 22 percent of children who died from the flu this season were vaccinated, according to the CDC's Brammer. "Every child that dies from influenza complications is a tragic death, and there's a substantial proportion of them that are preventable," Uyeki added. 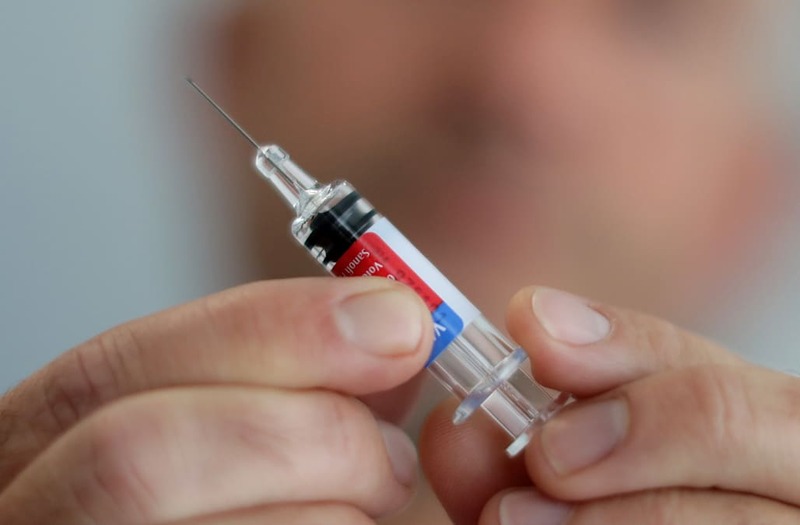 Furthermore, questions about the efficacy of this season's vaccine ― which ended up being 36 percent effective overall instead of the 10 to 17 percent initially reported ― were likely not helpful to the extent they may have discouraged people from getting vaccinated, both CDC experts said. Flu vaccines are typically 40 to 60 percent effective. Brammer, Uyeki and Munoz-Rivas all stressed that while the vaccine may not be as effective as they'd wish, it's still a tool worth using. They all pointed to a CDC study that showed vaccination has a 65 percent chance of preventing death in children without underlying conditions. It's not a cure-all, but it can lessen the severity of the disease and potentially prevent the unthinkable, they said. The CDC experts and Munoz-Rivas also stressed the importance of early intervention with antiviral drugs, saying some physicians could get better about prescribing them. The experts wish that getting children vaccinated was easier. "You really need to have a dedicated, motivated parent to make an appointment just for a flu shot," said Munoz-Rivas, noting how that parent may have to take time off from work and pull the child from school or juggle getting to a clinic among a hundred other weekend chores. And even if children get a flu shot, they aren't 100 percent protected. Marotta's son had the flu shot, but the vaccine Joseph received didn't include the pandemic strain that ultimately killed him. An updated flu shot, with that strain included, became available in their area two weeks after he died. But Marotta analogized the vaccine to a seat belt: Just because a seat belt isn't going to save your life in every car crash doesn't mean you shouldn't use it. "The flu vaccine is not perfect, we know that, but it's the best preventative measure we have today," Marotta said. "One thing that bothered me in the media today was people saying it's only 36 percent effective. But let's put that into context ― 36 percent is better than 0 percent." The CDC has recommended since 2010 that everybody over the age of 6 months get vaccinated for the flu ― and that pregnant women get vaccinated in order to help protect those under 6 months. Yet the vaccination rate this past fall was approximately 39 percent for the U.S. population. Mia was not vaccinated for the flu because the Lobos were worried about the effect it might have given her history of febrile seizures. Parents of kids prone to febrile seizures are often concerned about the potential risk. Lobo said it's impossible to know if Mia could have been saved with or without the vaccine. He said he knows he and his wife did everything in their power ― taking Mia to the ER twice and to the doctor's office ― to keep her safe. "All I can say is the flu can hit anybody. You never know how you might get it and when you might get it," Lobo said. "And nobody should die, but especially not a child who has their whole life to live in front of them."